A new law born from the tragic abduction and murder of 11-year-old Ashlynne Mike allows for increased collaboration, expanded resources, and thoughtful measures to protect children on tribal lands. 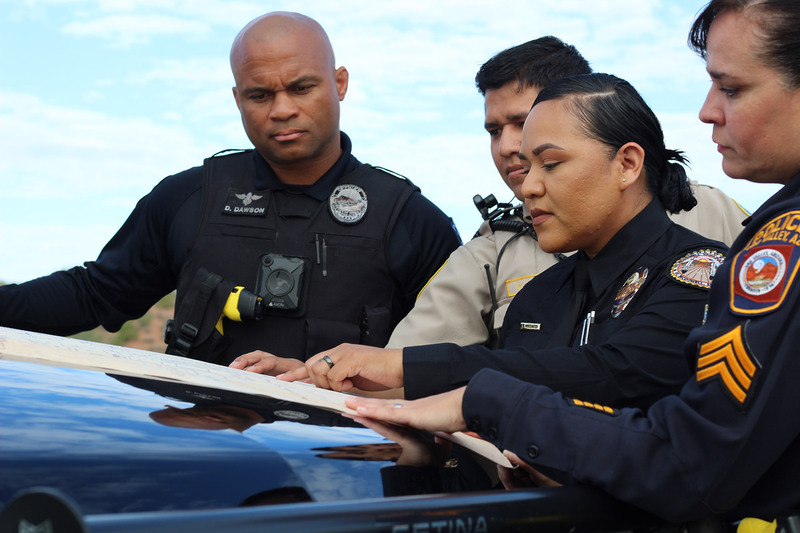 As leaders from myriad Arizona tribes converse with Arizona public safety officials at the We-Ko-Pa Resort and Conference Center at Fort McDowell, Arizona, one thing becomes clear: They each bring with them different life experiences. But they’re bonded by a common belief: “That protection of our children is number one,” says Deb Nez Manuel, a Navajo political activist and advocate with the multi-tribe Morning Star Leaders Youth Council. “So is understanding our strength when we come together” to prevent and solve child abduction-related crimes, she adds. Manuel is one of 60-plus people instrumental in the success of child recovery systems who attended the “Implementing AMBER Alert in Indian Country” training event in Fort McDowell, Arizona, Sept. 25-26, 2018. The free two-day workshop was held in support of the Ashlynne Mike AMBER Alert in Indian Country Act, signed into law in April 2018. Funded by the U.S. Department of Justice (DOJ), the law provides training and other resources for America’s 567 federally recognized tribal lands to utilize AMBER Alert systems. On the training front, events similar to the brainstorming and networking session at Fort McDowell will be held throughout 2019 to ensure tribes can successfully develop comprehensive and collaborative child protection strategies that include AMBER Alert capabilities. Additionally, these events will help tribes prepare to assess resource, technology, and staffing needs; learn about multiple training options and online resources free for use; plan for community education and assistance; and contemplate lessons gleaned from the 2008-2010 AMBER in Indian Country pilot project. With each event held, the body of knowledge, insights and lessons learned will grow, fortifying a shared commitment to AMBER Alert in Indian Country across North America. Though a positive step forward in protecting Native children, the Ashlynne Mike AMBER Alert in Indian Country law was born from the tragic death of its young namesake. In May 2016, 11-year-old Ashlynne and her younger brother, Ian, were abducted while heading home from school. While Ian managed to escape his captor and report the kidnapping to a couple who discovered him wandering the desert in search of help, unfortunately Ashlynne would be sexually assaulted, bludgeoned, and left alone to die in a remote area of desert near the Shiprock Pinnacle on the Navajo Reservation, within 30 miles of her home. Ashlynne’s case, considered one of the worst crimes ever to hit the Navajo Nation, revealed a number of obstacles and recovery effort delays resulting from the Navajo Nation not having an AMBER Alert system in place for use on the largest reservation in America. Ashlynne’s death, and the dangerous conditions it exposed, would shake to the core not only Ashlynne’s family, but also tribal communities around the nation, whose members collectively recognized an urgent need to strengthen child recovery systems on Native lands. Following Ashlynne’s murder, her mother, Pamela Foster, embarked on a tireless, 18-month campaign for legislative reform that ultimately would be championed by the late Arizona Senator John McCain and a bipartisan group in Congress. The Bill created received widespread support from the National Congress of American Indians, the Inter-Tribal Council of Arizona, the Navajo Nation, and the Hopi Tribe and many others. By February 2018, the Navajo Nation had implemented an emergency alert system capable of issuing AMBER Alerts and other urgent notifications to the 11 counties within its tribal boundaries. Though human rights advocate Cindy McCain, wife of the late Senator John McCain, had planned to attend the “Implementing AMBER Alert” event, her husband’s death in the weeks prior would prevent that. Generously in that difficult time, Mrs. McCain developed and shared an inspirational message for attendees that was read by Jim Walters at the event. She went on to record a video message that will benefit AMBER Alert in Indian Country partners and training participants for months to come. In her message, Mrs. McCain then recognized and thanked Ashlynne’s mother for her courage and tenacity. In turn, Foster paid respect to the McCain family when speaking to event participants, offering condolence for their recent loss and gratitude for their continued dedication to helping others. As she told her story to a riveted audience, Foster relived her anguished efforts to find Ashlynne after her disappearance. And that she did – lobbying state and national law makers for more than a year to do everything possible to keep other Native families from ever experiencing the chaos and grief she and her family endured. Breakout sessions designed to delve into those needs prompted a discussion of real and perceived challenges associated with implementing AMBER Alerts. Most-cited concerns included a lack of understanding about AMBER Alert systems protocols and contacts; inadequate funding to hire first responders; and inability to acquire advanced technology capable of reaching other law enforcement agencies and residents of reservations who live within vast geographic expanses often with difficult terrain. The Navajo Nation, for instance, encompasses both mountainous and cavernous terrains within its territory, spanning 27,000 square miles across Arizona, New Mexico, and Utah. Having the right training and equipment can mean the difference between life and death, said Gilbert Orrantia, Director of Homeland Security for the State of Arizona and Co-Chair of the Governor’s Arizona Human Trafficking Council. Another major hurdle mentioned was a lack of operational agreements, or Memorandums of Understanding (MOUs), addressing the jurisdictional sovereignty of a tribe. “Jurisdiction can pretty much get in the way for the well-being of our people, especially in Indian Country,” said Navajo Nation Vice President Jonathan Nez. The Navajo Nation, for example, has 110 chapters (of semi-autonomous local governments) that need to be both reached and respected. Another challenge addressed during the sessions: Certain societal beliefs, or disbeliefs, that sometimes stand in the way of progress. That observation particularly resonated with attendee David Antone, a council member with the Salt River Pima Maricopa Indian Community. “In our society, a lot of people believe that if you ignore something it will just go away. But it won’t. In fact, it probably will increase,” he said. But armed with the best-practices advice offered at the training sessions, “the future is something we may be able to dictate in Indian Country to stop this type of crime,” he added. For her part, Manuel believes tribal leaders and communities should proactively and openly engage with one another – and definitely enlist the help of kids in their respective communities. Workshop attendees left appreciating having learned from one another and developed new contacts. They also noted ideas for helping strengthen future meetings and preparing to adopt AMBER Alert systems. An Arizona law enforcement participant shared that hearing the needs of different tribal members and the hurdles they face in implementing AMBER Alerts was very helpful. Of particular value, she noted, was hearing how the Navajo Nation designed its alert. The officer expressed looking forward to learning from tribes that have successfully issued and worked through an AMBER Alert, and hopes case study examples from these successes can be developed and provided through training. Meanwhile, Arizona’s tribes embrace the power of AMBER Alert – and set the course for other tribes in the nation to follow. Ashlynne’s mother Pamela is hopeful about what lies ahead. Please feel free to contact us regarding the AMBER Alert in Indian Country website.